An Engineer in DC: Every Accident Can Be Prevented ... but At What Cost? Every Accident Can Be Prevented ... but At What Cost? 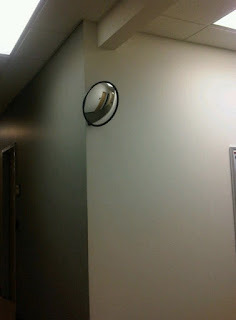 Yes, my place of employment has now taken to putting up mirrors on the corners of the hallways, in order to prevent burns from hot coffee that might be incurred by two people bumping into each other. I also recently saw a street crossing, with a pile of orange flags at each end of the crosswalk. The thinking is you're supposed to grab a flag and wave it as you cross the street, so cars don't hit you. Here's what I get: liability is expensive. In the construction industry, it's bad news if your company has a reputation of being unsafe. Lawsuits are absurdly expensive, to the tune of $1M+ for injury, lawyer fees, and additional insurance costs, and they can skyrocket from there. And it's additive: have 1 accident, and your comapny's accident insurance goes up. So, sure, it makes financial sense for a company to invest $100,000 in making an environment safer, if they think it'll help prevent a $1M accident that only has a 10% chance of occurring. In industries where people work in close proximity to large, rotating equipment -- it makes a lot of sense to ensure people don't get caught in the gears. Here's what I don't get: the unbridled, pervasive, never ending burden of safety requirements, and the safety officer's unchecked ability to Stop Work for an arbitrarily small potential safety issue in non-hazardous environments. Nobody seems to calculate the cost, the reduced ability to do work, the impact to productivity, or the imapct to morale of requiring everyone to take three levels of electrical safety training until they can work on their 100V, milli-amp equipment again. (Note to non-technical readers: a high voltage is not necessarily dangerous. The spark you get from static electricity in the wintertime can be 6,000 volts or higher. No big deal, becuase the current is really low.) Or the lost time due to requiring everyone in the company to sit through this year's collection of 12 safety videos, complete with quizzes at the end. Note to safety officers: As an office worker, I assure you, I have forgotten everything about that ladder safety quiz within 2 weeks. Here's what I also don't get: A draconian, inflexible rule system. In many instances, you're given limits within which you're allowed to do your work. If you're a Level 1 worker, for instance, you get to do A, B, and C. But if you want to do 1.000000001C -- something just barely outside the norm of C -- then suddenly the door slams down and you need to get Level 55 worker training, which takes six months and costs thousands of dollars. Safety officers gleefully point to the rule book and say, "I'm not authorized to grant an exception. This is for your own good." Sometimes I pine for the (perceived) halcyon days of the 1950's and 1960's, where I get the impression that you could saunter down to your technical area, and start doing work. Look, you pay us professionals well and we're smart people; when we get into unfamiliar territory or we do something we're not comfortable with, we ask for help. I fear that the "scope creep" of allowing people to do less and less because of some infinitesimally small chance that something might go wrong is creating a "never try" attitude in society. Preventing me from doing anything because something might go wrong seems a perverse motivation, after they ostensibly hired me because of my intelligence and dilligence. A different society, one that allows and accepts a certain low-level of accidents could be a very productive society indeed.